Wall ties are an essential element for the stability of a cavity wall. Wall ties anchor the weather protecting facade of a cavity wall to the main structure of a building. The wall tie system enables the static and live loads that are carried by the inner leaf to be transferred by the wall ties and shared by both walls. Typically, a cavity wall tie is bedded in a mortar bed joint as a building is being constructed. Wall tie failure can be a consequence of a construction defect; by incorrectly fitting ie galvanised rather than stainless steel, fitting with wall ties that are too short or left out all to gether. 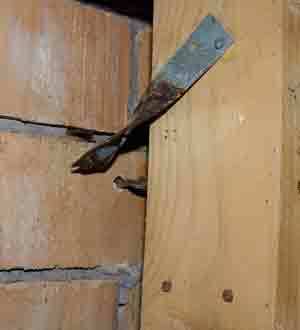 Alternatively wall tie failure may be a result of a buildings aging process, and caused through wall tie corrosion. Over time mortar bed joints, which host the wall ties, undergo a chemical change through carbonation. The mortar becomes aggressive to mild steel wall ties and their protective coatings, reducing the life expectancy of the brick ties especially in hostile environments such as near industrial areas and coastal locations. The design life of the building is typically much longer than the tie life span and it therefore follows that at some point the wall may need replacement of its wall ties if the stability and the load sharing capacity of the wall structure are to be maintained. As wall tie corrosion sets in the steel wall ties generate a build up of iron oxide (rust) layers which occupy a greater volume than that of non-corroded steel. 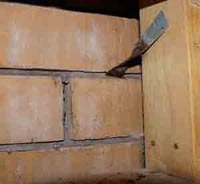 In most cases, particularly when wire wall ties have been used, the increase in volume is accommodated within the mortar bed as the cavity wall tie erodes. In such cases there may be little sign that the outer facade is free-standing and the walls un-supported, save that the wall may appear bulged or out of plumb. In other cases, particularly where sheet steel or vertical twist wall ties have been used in less forgiving mortars, the iron oxide build up may have the effect of lifting the masonry above wall tie positions. If expansion is widespread and present along a row of corroding wall ties, a tell-tale pattern of horizontal cracks may be produced. In brick veneer construction, ties are used to pass all the lateral out-of-plane loads and forces (such as from wind) to the structural backing. In cavity brick construction ties either pass the lateral out-of-plane loads and forces to the stronger leaf or share them between the leaves. Type A ties are those that have no specific seismic design characteristics. It is difficult to find brick ties other than Type A in Australia. Ties are available in heavy, medium and light duty in galvanised steel, stainless steel and plastic. Stainless steel ties are used in situations requiring exposure grade materials or very long life. Galvanised steel ties are those most commonly used. Matrix resilient wall ties satify both structural and acoustic BCA requirements. Selection of cavity wall ties. The user is to determine that the correct tie is selected to comply with structural requirements and to comply with all relevant building regulations and codes. Spacing of ties should be in accordance with design requirements of the structure and in accordance with relevant building regulations and codes. 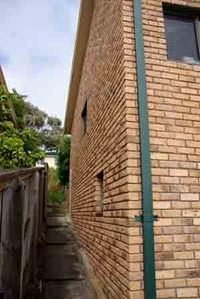 The Newcastle (NSW) earthquake which occurred in 1989 showed masonry survived well except where the ties were deficient. Ties are required to meet the durability requirement of the site for the design life of the building. Should the design life of the building be exceeded and the ties begin to fail, they can be replaced with remedial ties. Where any type of cavity tie failure has been established the walls should be immediately stabilised with new stainless steel remedial wall ties. Where each leaf is at least 90mm thick the replacement wall ties are installed into the masonry at a density of 2.5 per sq. metre, tie centres measuring 900mm horizontally and 450mm vertically with additional ties inserted aroung openings and wall ends. 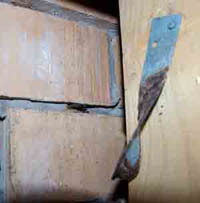 Additional remedial wall ties should be installed adjacent to open reveals. Wall tie replacement systems are simple to install and can be fitted by most general builders and competent DIY enthusiasts. Where wall tie corrosion and expansion has resulted in horizontal cracks to the walls a qualified engineer should be asked to assess the potential for continued expansive damage and to weigh this against the damage that could result from efforts to remove or isolate all the corroding wall ties and other metals buried in the wall. Remedial work to remove or isolate existing wall ties and other corroding metals is a separate and delicate task requiring extreme care if the masonry is not to be unduly damaged. Such care and skill may be best provided by time-served professional tradesmen. Helical Wall Tie: A profiled and twisted replacement wall tie that is driven into a small pilot hole in masonry such that work hardened helical blades cut a spiral interlocking seating path into brick, block and concrete as the tie is driven by a series of impacts. The tiny 6mm pilot hole enables 8mm helical wall ties to be installed with minimal cosmetic disruption to the facade and to any insulation in the cavity. Driving the helical wall ties takes only 5-10 seconds, making them the fastest remedial wall tie product available. The deep thread of the helix also makes these remedial wall ties ideal for use as a lateral restraint tie, tying walls to the end grain of floor joists. Chemical Fix Helical Wall Tie: A remedial wall tie that is pushed into a resin or grout-filled hole in one leaf and has the bonding agent pumped around its other end. The bonding agent sets around, and keys to, major deformations located at each end of the cavity tie. Resin grouted replacement wall ties are well suited to domestic buildings having inconsistent or suspect quality masonry. The installation process is more intricate, demanding more time and care.